Dawyck Gold Beech is a narrow form of beech with stunning gold foliage which keeps the brown leaves on through winter. This makes it a splendid tree for parks and smaller gardens, there space is limited. Beech thrives just about anywhere apart from exposed coastal locations. It does well in most reasonably fertile, freely-drained soils, except clays and light sand. Dawyck is so expensive because they take a long time to grow and a lot of the trees do not make the grade so you can be sure that what you are receiving has survived the strongest of inspection standards over a 4 to 5 year growing period. The RHS were so impressed with the Dawyck Gold Beech tree that they gave it an award. There probably was no award ceremony with red carpets, camera flashes going off everywhere and dull tree speeches, probably more a load of tree "Normans" and "Normettas" sat around a gas stove in a shed drinking tea and taking votes on which trees are worthy of their admiration and respect. 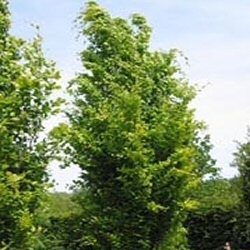 This tree is supplied at a height of between 1.5 and 2.0 metres in a 12 litre container for year round planting and better results than from either bare-root stock or rootballed stock. Expect a final height of between 15 (50ft) and 20m (67ft).